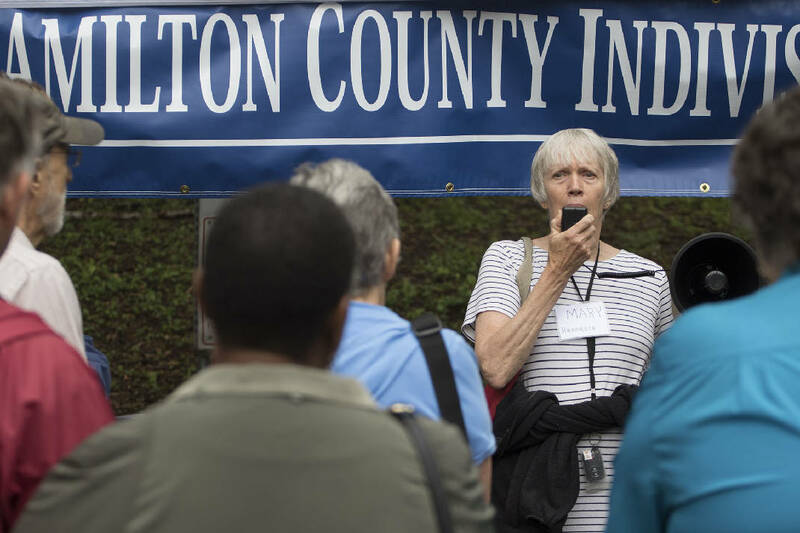 Mary Headrick speaks during a Truth to Power Rally hosted by Indivisible Chattanooga at Miller Park on Tuesday, April 18, 2017. The rally is in support of our environment and the EPA, healthcare for all, fair and humane immigration policies, and an independent investigation of Russian sabotage of the United States' 2016 elections. Local opponents of the Trump administration continued Tuesday to criticize GOP lawmakers for avoiding public meetings with their constituents. A group of about 35 members of the Hamilton County Indivisibles, one of several local anti-Trump administration organizations, rallied in Miller Park shortly before noon after presenting position papers outlining the policies they support to representatives of U.S. Rep. Chuck Fleischmann and U.S. Sen. Lamar Alexander. They visited the office of U.S. Sen. Bob Corker on Monday. None of the senators were in their offices at the time. Democratic activists across the U.S. have followed a similar pattern, organizing opponents of GOP policies on issues such as health care or immigration to pack town halls whenever members of Congress have held them, or criticizing them for hiding from their constituents when lawmakers have avoided the public. At the rally, recently elected Hamilton County Democratic Party head Khristy Wilkinson criticized the GOP lawmakers for avoiding their constituents. "[Monday] night, over 100 people were at our town hall meeting at the public library," said Wilkinson, who ran a losing campaign against state Sen. Todd Gardenhire, R-Chattanooga, in November. "Not a single elected official was present. Not a single one." Wilkinson encouraged those in the audience to organize to support the policies they support. "You get what you are organized to take," she said. Fleischmann's office denied he was avoiding constituents, saying in a statement that the congressman held a telephone conference call less than two weeks ago in which residents of all 11 counties in the district could ask questions. "This is an effective way for him to hear from as many people as possible," spokeswoman Maria Benson said. Similarly, Corker's office noted that he had held a question-and-answer forum in Arlington, Tenn., on Tuesday. "Senator Corker very much values input from his constituents and recently met with representatives from a number of concerned citizens' groups in Chattanooga," spokesman Micah Johnson said. "He is in Memphis today and is spending the entire week traveling across the state to answer questions and hear from Tennesseans." Alexander spokesman Ashton Davies said the senator "is meeting with Tennesseans this week on a variety of issues including the Obamacare emergency in Tennessee and his work to provide options for Tennesseans trapped in the collapsing individual insurance market. The senator welcomes all Tennesseans' comments and concerns and keeps them in mind when making decisions." Other speakers at the Miller Park anti-Trump rally focused on the administration's policies on health care, immigration, environmental protection, and possible interference by Russia in U.S. politics. Retired Dr. Mary Headrick, who unsuccessfully ran against Fleischmann in 2012, criticized GOP efforts to repeal the Affordable Care Act, saying "they are trying to take the word 'affordable' out of it." Local attorney Melody Shekari, whose parents immigrated to Tennessee from Iran in the 1980s, encouraged activists to work for comprehensive immigration reform and to oppose Trump administration policies to detain and deport immigrants who are here illegally. Fleischmann defeated Shekari in the general election for the 3rd District seat in 2016. Barbara Kelly of the Sierra Club said new federal Environmental Protection Agency head Scott Pruitt was rolling back regulations that protected drinking water from coal companies, and she linked climate change to the increase in drought and wildfires in East Tennessee and Northwest Georgia in recent years. The Rev. Zack Nyein of Grace Episcopal Church told the crowd how his Burmese grandfather and other relatives spent time in prison for attending a political rally opposing their government before moving to Tennessee. Nyein encouraged the crowd to work for inclusiveness in government policies, saying, "We need to keep the 'all' in 'y'all.'"